On the same day we have an article in the Campbelltown and Macarthur Chronicle, the NSW Minerals Council takes out a full page ad saying “Hurt Mining, hurt Western Sydney”. Next to this ad, there is a special AGL gaslands tour advertised. Jobs are a major concern for Western Sydney, with residents here bearing the brunt of manufacturing job losses in recent years. Between May 2011 and May 2012, 2943 manufacturing jobs were lost in Western Sydney, an annual decline of 3.3%. But it’s not mining that has any prospect of providing a glimmer on the horizon. In fact, mining has inflated the Australian dollar, contributing to making Australian manufacturing less internationally competitive. Jobs per megatonne of coal mined have also decreased over time with increasing mechanization of production. Figures from the Australian Bureau of Statistics (ABS) for 2013 show the entire Gas & Mining Industry combined employed less than 0.2% or 20,700 Australians. This is only two thirds of the number of people employed at Bunnings. The Gas Industry would have you believe that in 2012 it created 100,000 jobs. They creatively inflate their figures by claiming incidental jobs outside their project. 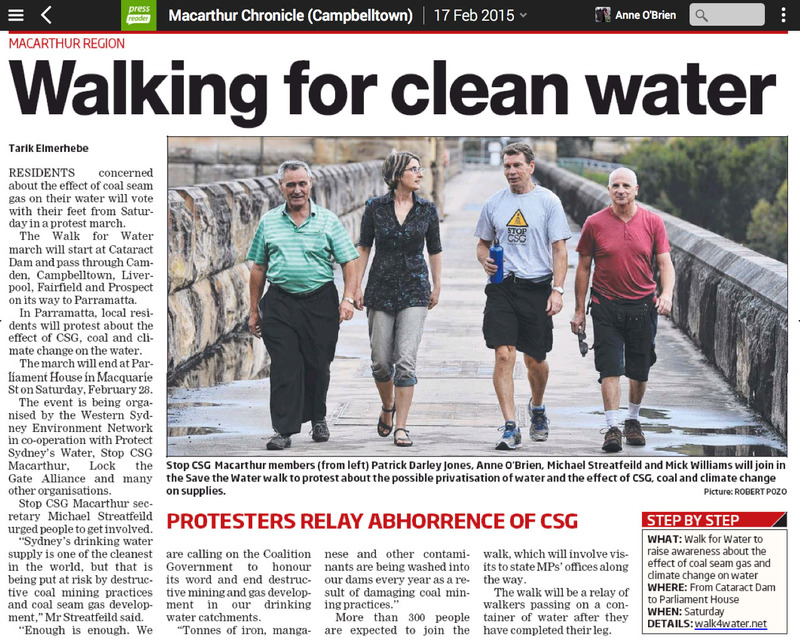 Those employed by CSG are only a fraction of that 20,700 and unfortunately this data is not collected by ABS. What does offer hope, is a proactive approach by local, state and federal governments. A planned industry transition worked when the BHP Newcastle steel plant shut down from 1997- 1999 and it has worked in other cases. This Friday night (20 Feb), in the city at Pitt Street Uniting Church, there will be a forum about jobs beyond mining- what some people call a “Just Transition”. Hear more about it here.